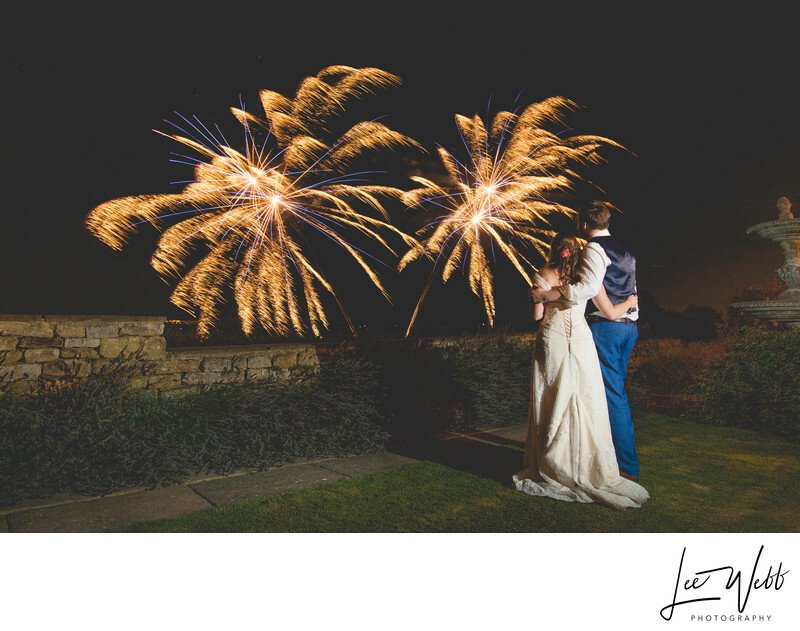 I am a Deer Park Hall recommended wedding photographer and have been for over 6 years. 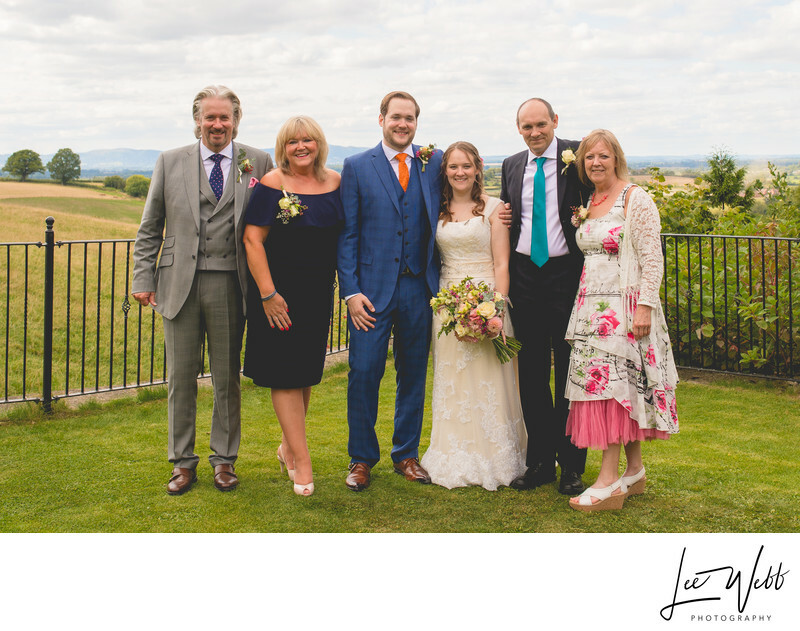 Malc and Jacky got married and had their wedding reception at Deer Park Hall in Worcestershire. 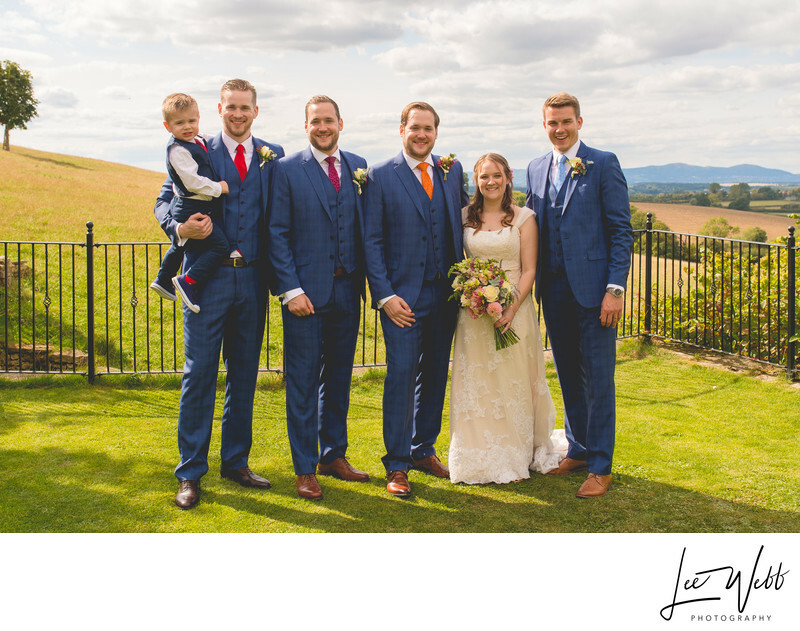 Deer Park Hall is a beautiful wedding venue, set on the border between Worcestershire and Gloucestershire near Pershore. 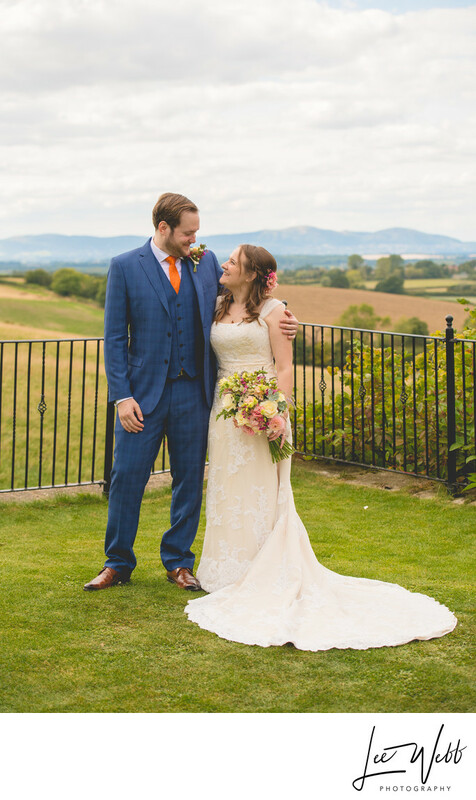 The venue itself sits in miles of rolling countryside, and the gardens provide views over the whole of Worcestershire, to the Malvern Hills 20km away. 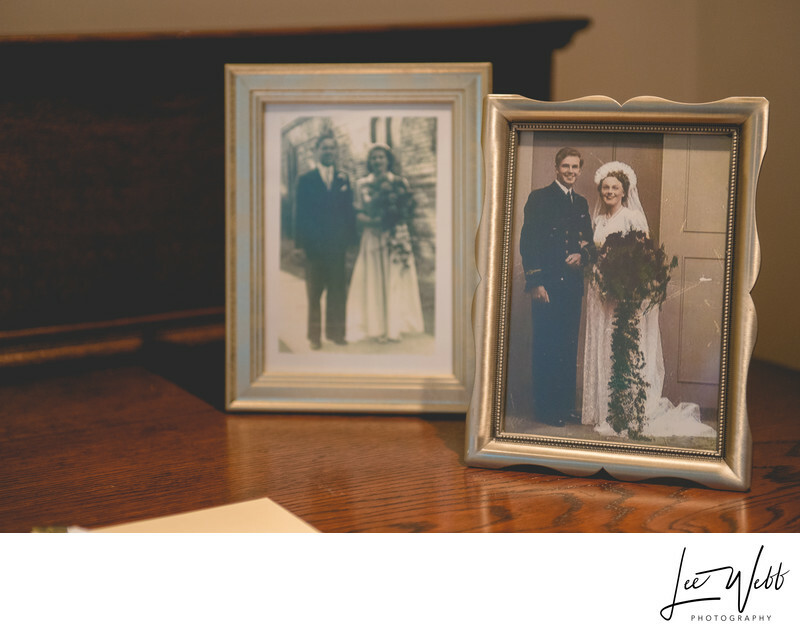 Upon entering Deer Park, the first things I noticed were the photos of Malc and Jacky's parents and grandparents that added a personal touch to the venue decorations. 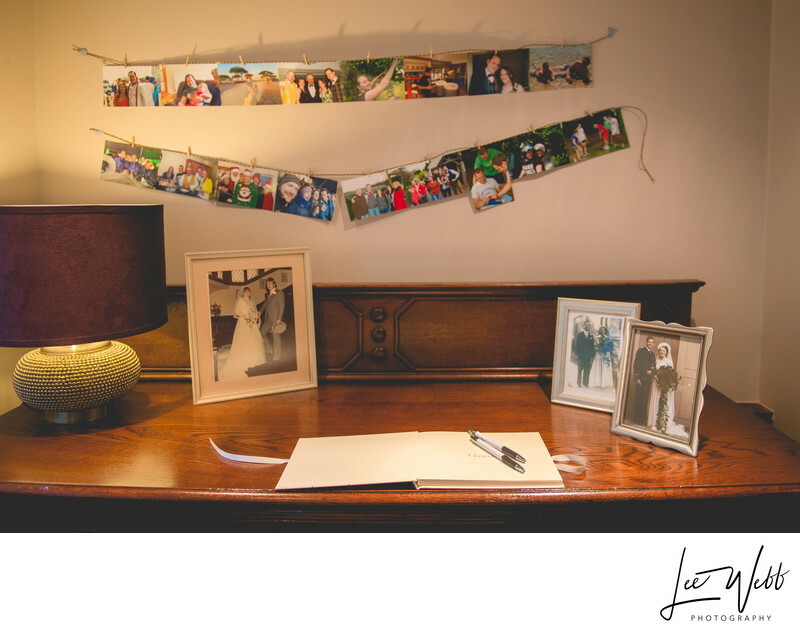 Above the photos of the previous family weddings, snapshots of the bride and groom throughout their relationship were hung from twine. 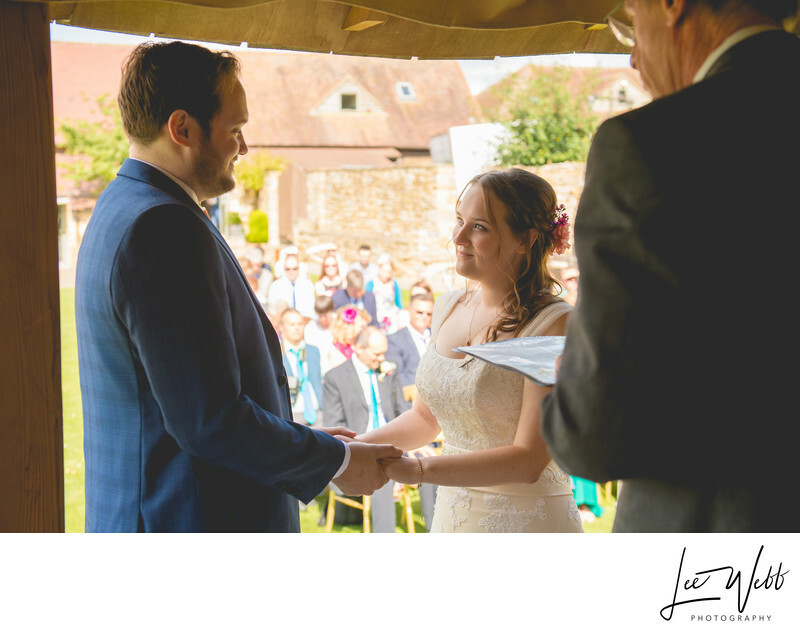 The bride and groom's guest book was ideally placed front and centre. Wedding signing books can be tricky to fill sometimes, especially when this is left to after the wedding breakfast has been served and the wedding guests have began to disperse. 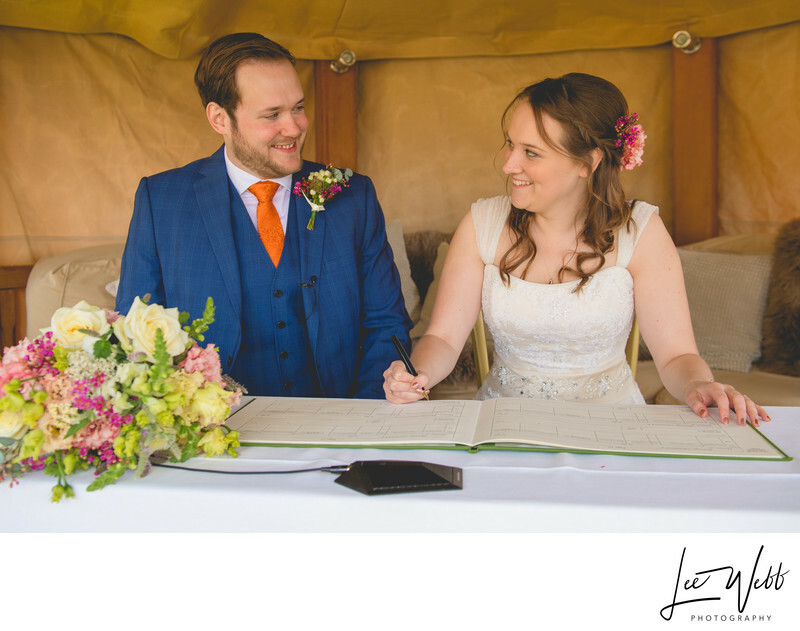 Having the signing book here meant that it was immediately accessible to all of the guests, and attention was drawn to it by means of the wedding photos. 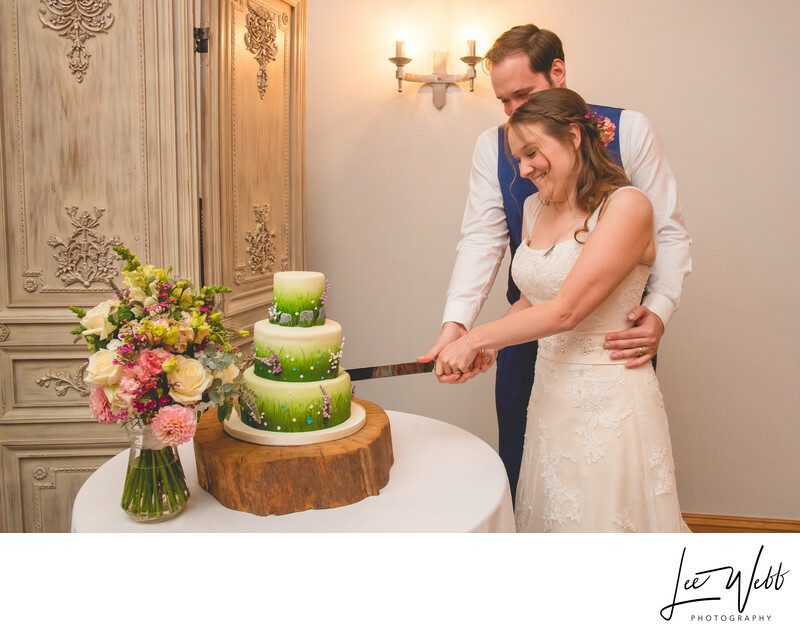 After photographing the details in and around the ceremony room, I made my way into the reception room where the wedding cake had just finished being set up. 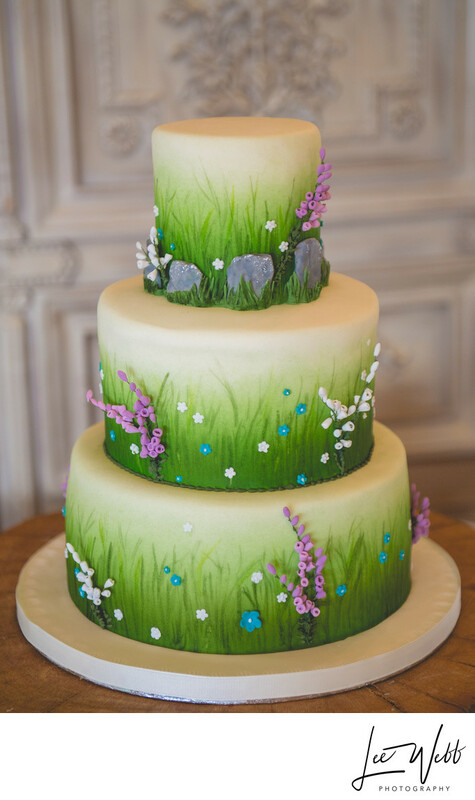 The cake was stunning, decorated to look like the grounds of Deer Park which was a lovely touch. 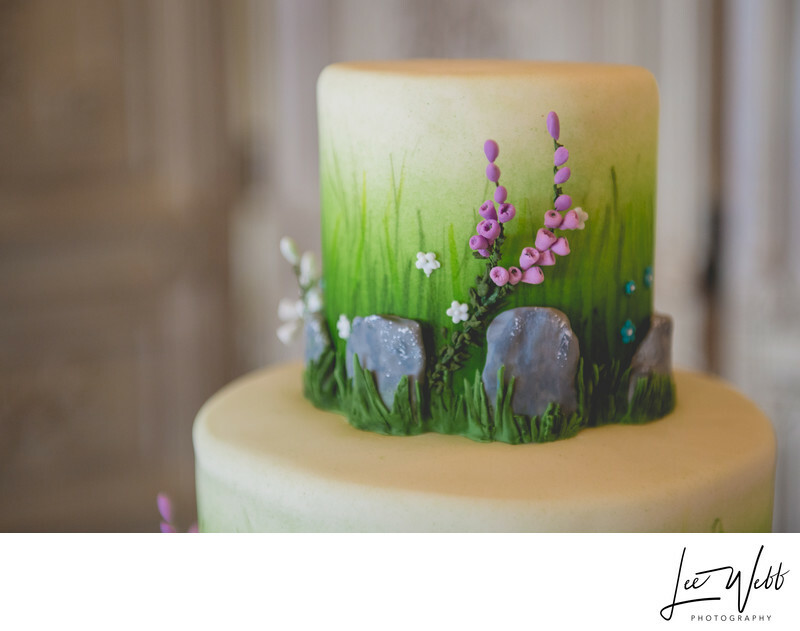 The wedding cake featured painted on grass with three dimensional flower decorations. 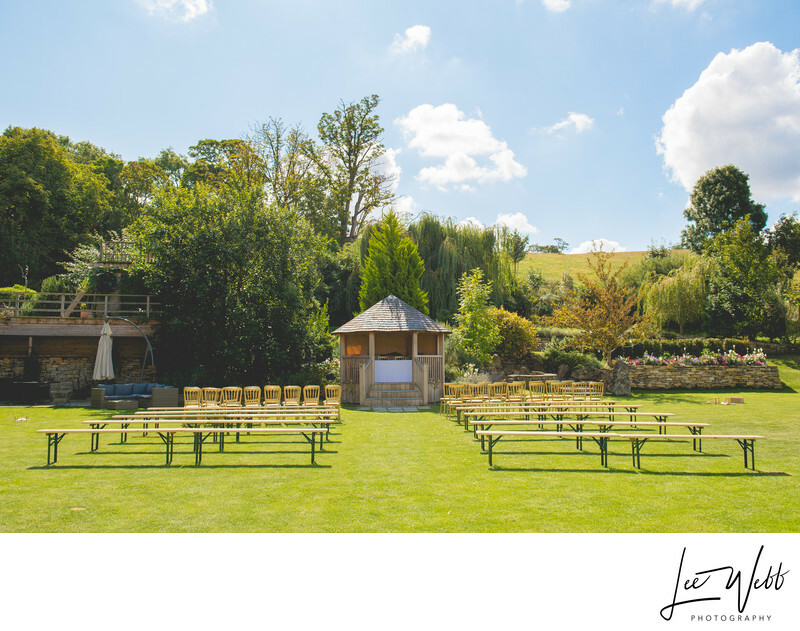 This image shows the layout that was used for Malc and Jacky's wedding reception. 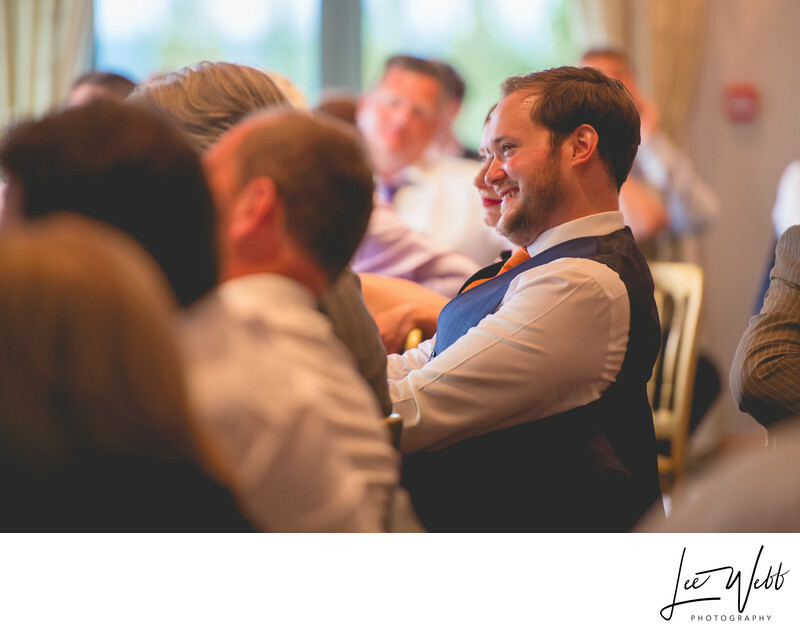 Traditionally, most of the weddings I've been to have featured a long, thing top table with the people on it sitting shoulder to shoulder. 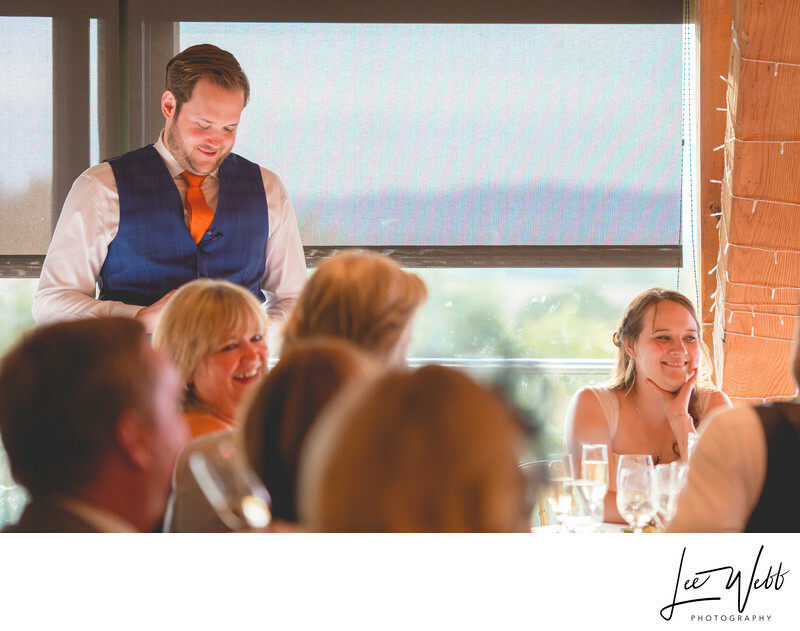 Whilst this gives the people on the top table a great view of the wedding reception, and the guests a great view of the bride and groom, it doesn't lend itself well to conversation - guests on the top table are usually only able to talk to the people immediately to their sides. 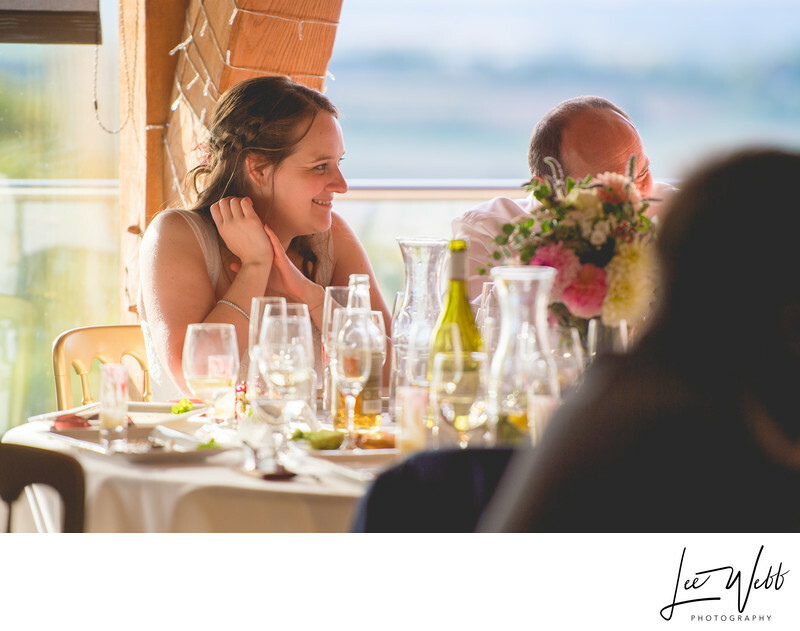 A round table means that the family atmosphere isn't lost, and can often feel quite intimate. 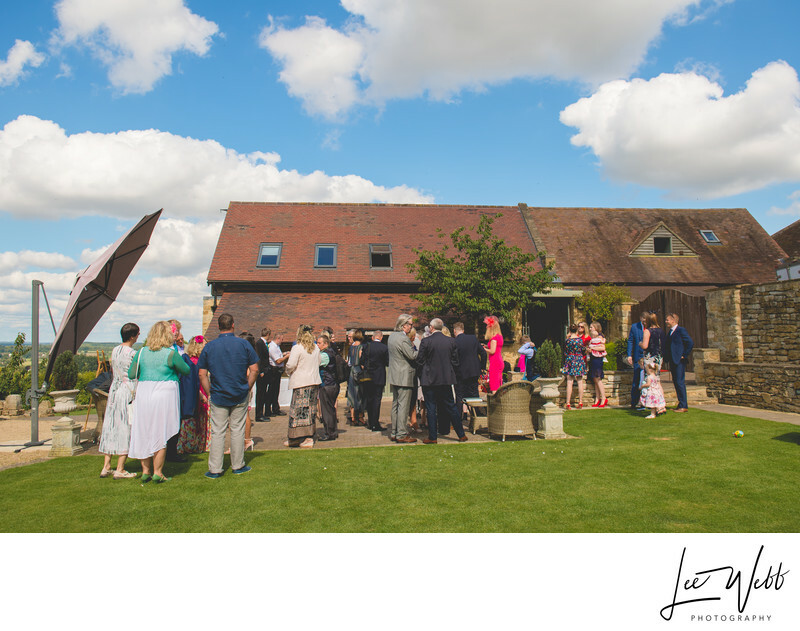 The weather for Malc and Jacky's outdoor wedding was amazing. It couldn't have been a nicer day - warm, with a lot of sunshine and broken cloud. There also wasn't a breath of wind. 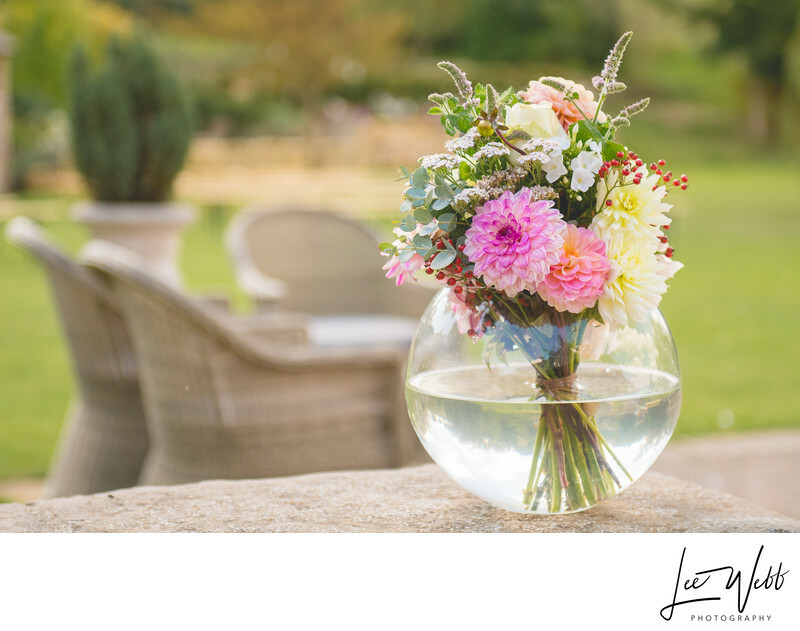 Later in the day but before the ceremony, the outdoor seating area was dresses with vintage milk urns filled with flowers. 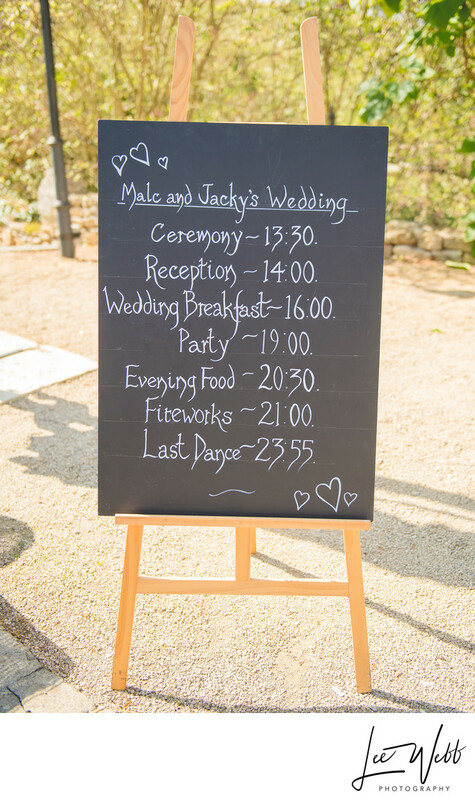 Malc and Jacky had the great idea of displaying the time table for their wedding day. 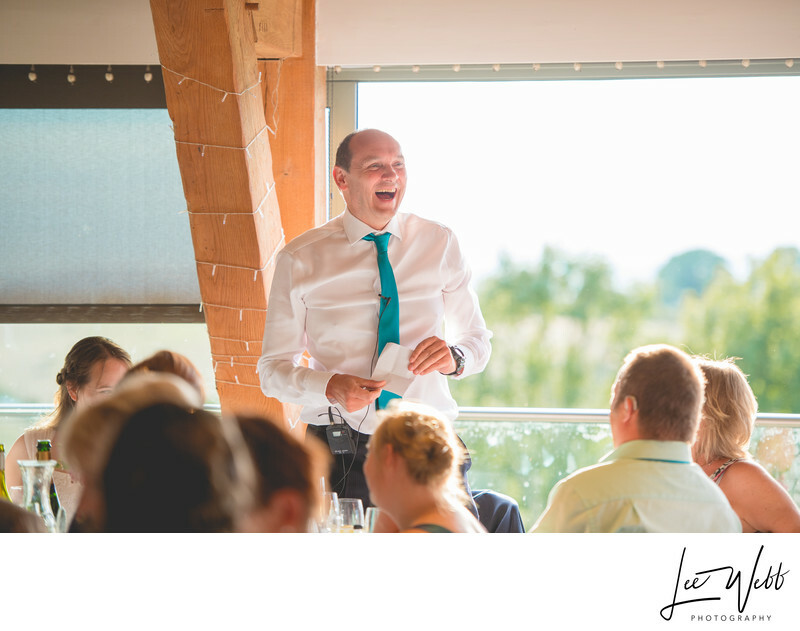 Letting your guests know when the wedding photos are to be taken is a really useful thing, as it *should* prevent people wondering off or hiding in the bar when they're needed. 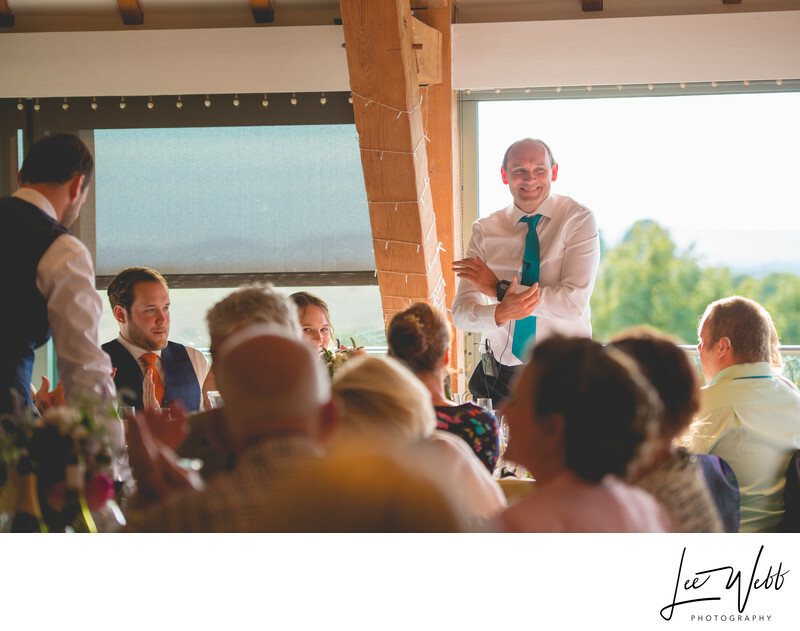 As you can see, the couple left ample time (2 hours) between the end of the wedding ceremony/beginning of the drinks reception and the wedding breakfast beginning. 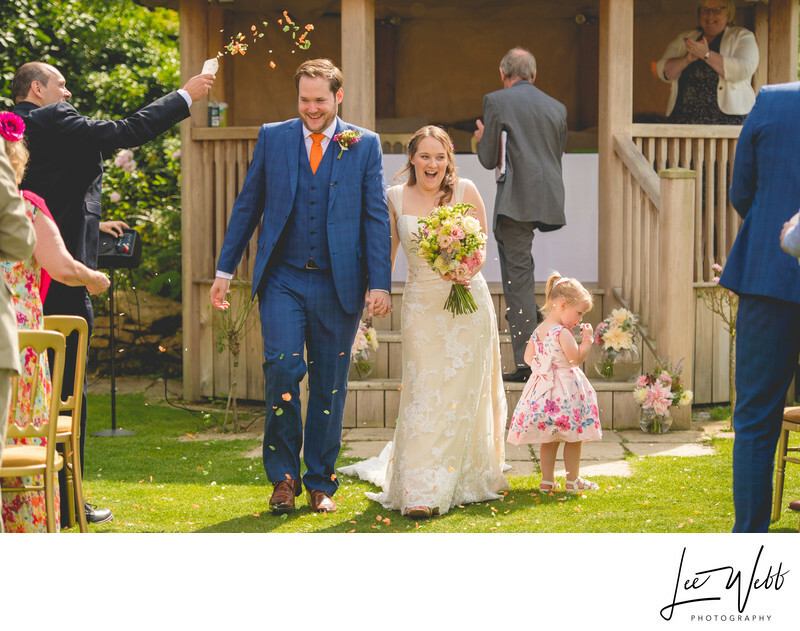 This paid dividends as Deer Park has so many opportunities for stunning wedding photos as you'll see later in this article. 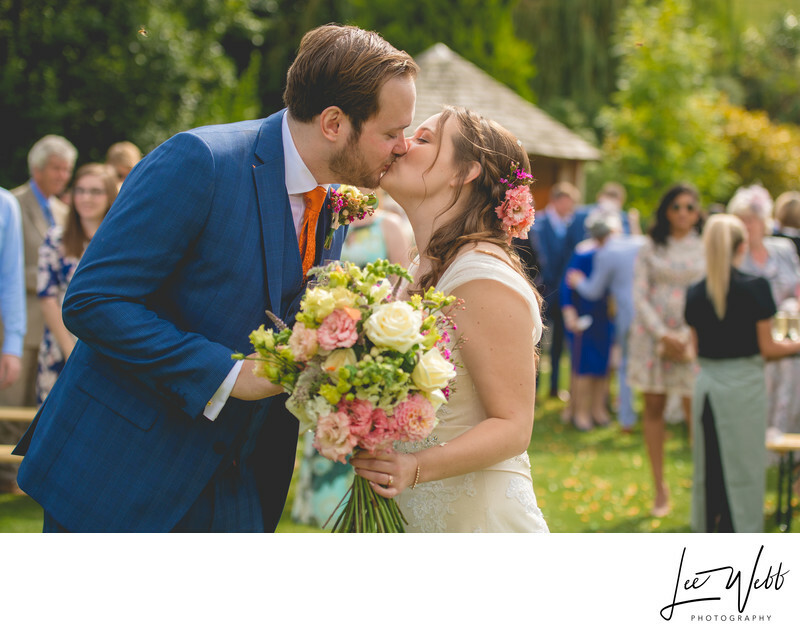 The exterior of Deer Park was decorated with these stunning wedding flowers, with the subtle shades of pink and yellow not overpowering the beauty of the venue itself. 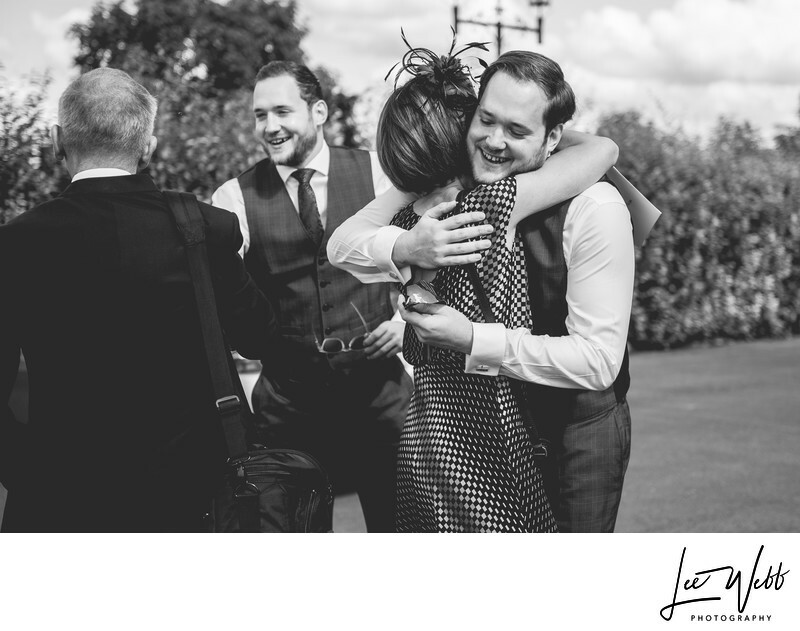 Just after midday I moved to the front of Deer Park to await the arrival of the groom and his near-identical twin brother who was his best man. 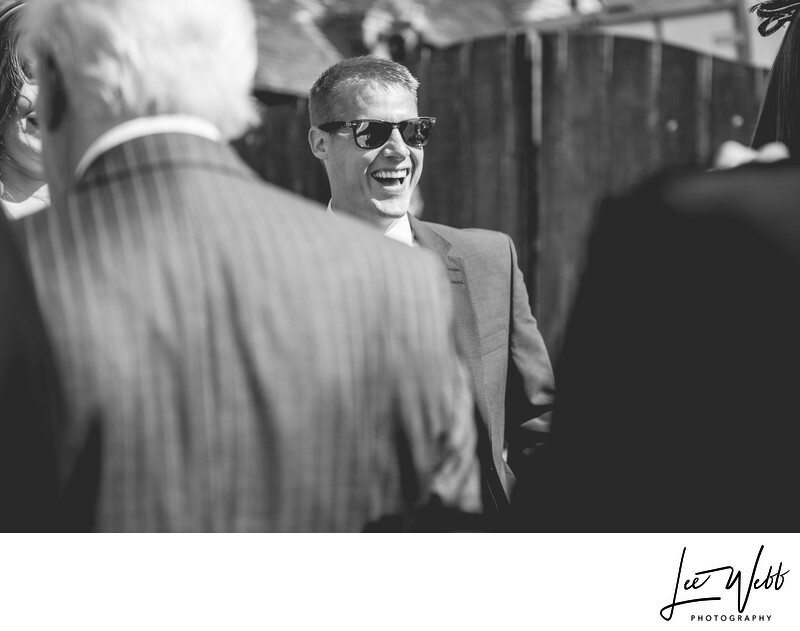 At the same time, many of their wedding guests had started to arrive so I spent time snapping the interaction between the groomsmen and their friends and family. 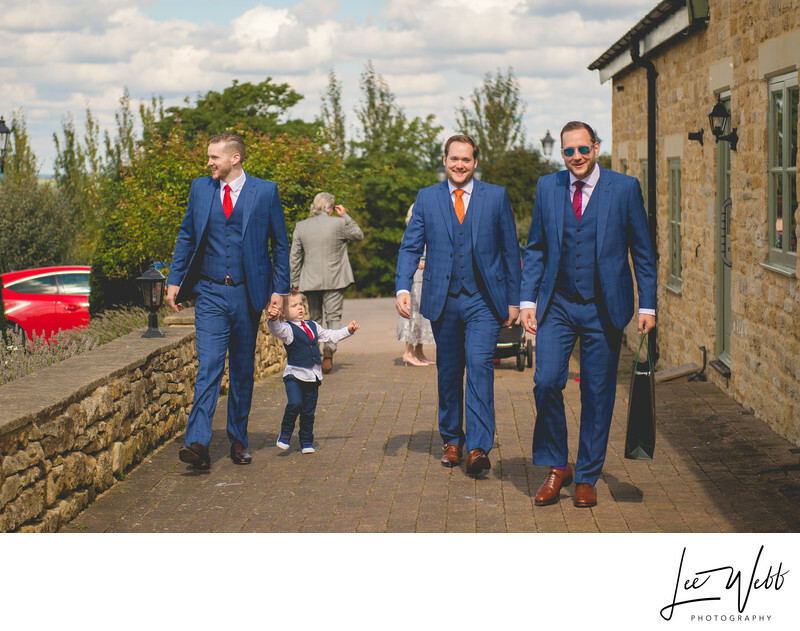 I really like the classic wedding photo above, showing the groom and his groomsmen making their way towards the venue, line abreast. 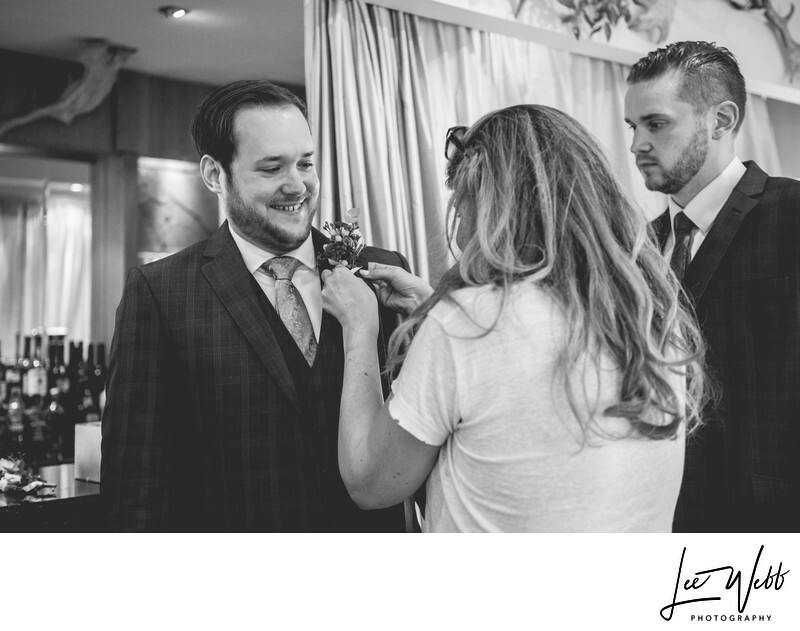 Once inside, the florist met with the groom and showed him to his buttonhole flowers. 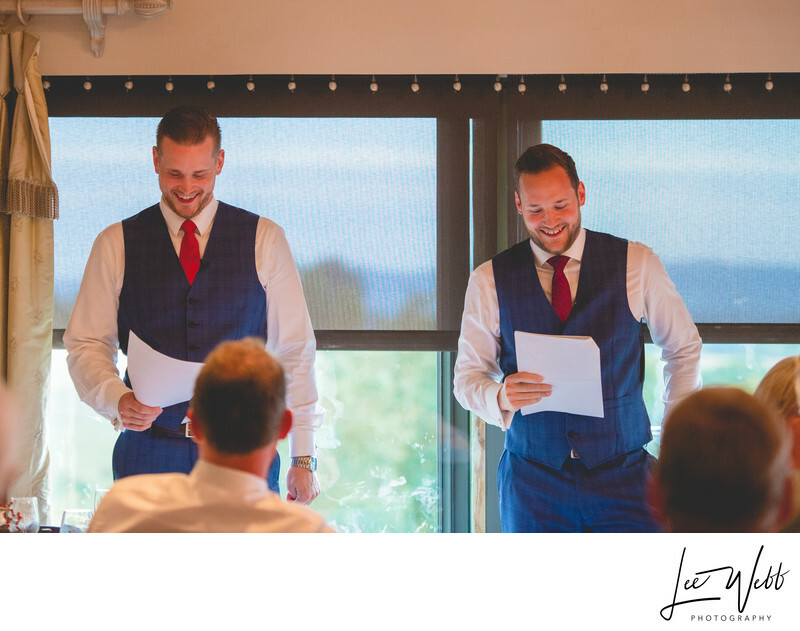 The groom and his brother attempted for a few moments to put the flowers in themselves with no real success. 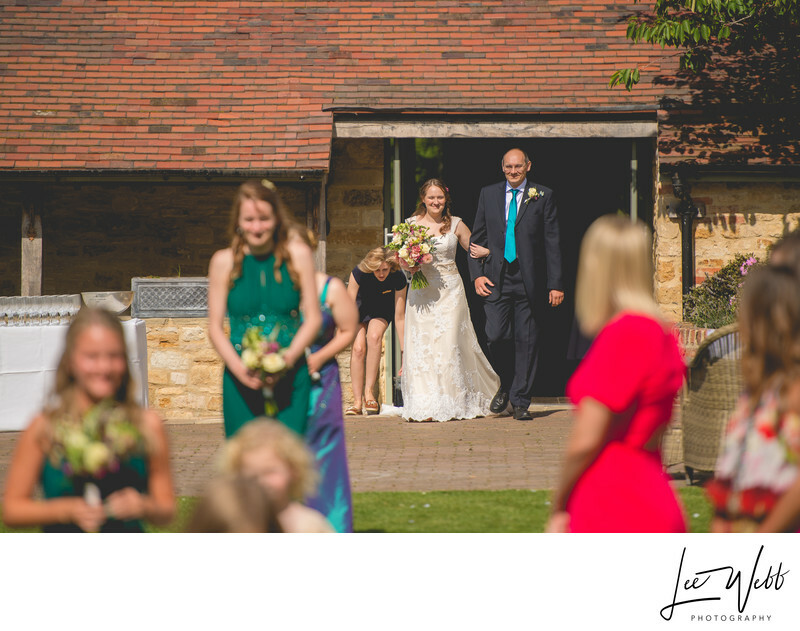 Usually I would step in and help, but one of the wedding guests came forward to lend a hand, adding to the photographic opportunities. 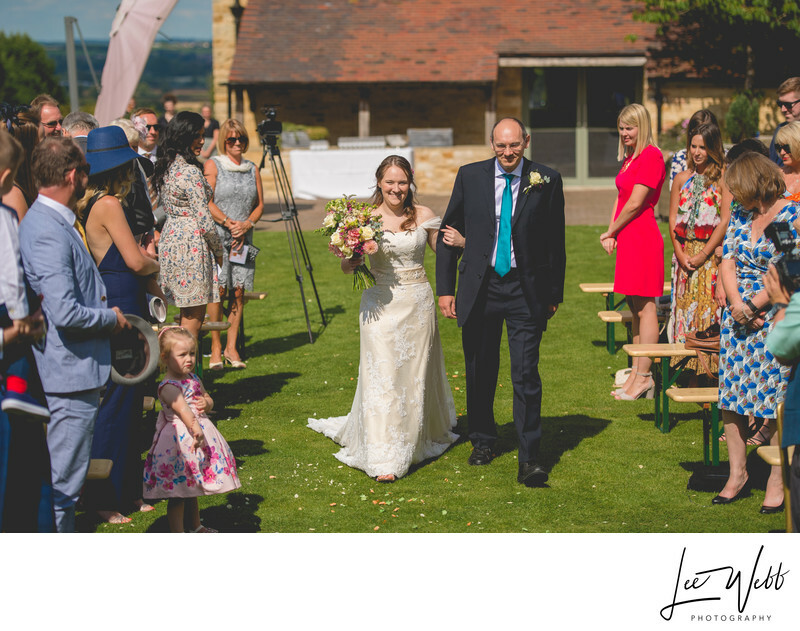 As it was such a beautiful day, the wedding guests were waiting for the start of the wedding out on Lamb's Leap Lawn, at the far end of which, the wedding ceremony itself would take place. 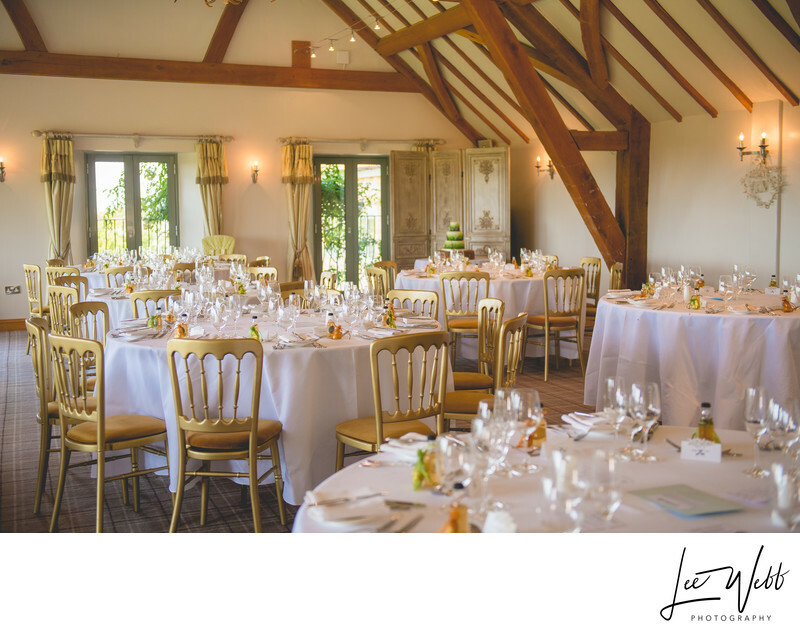 Below you can see Deer Park Hall itself, the converted barn that's now used as a wedding venue. 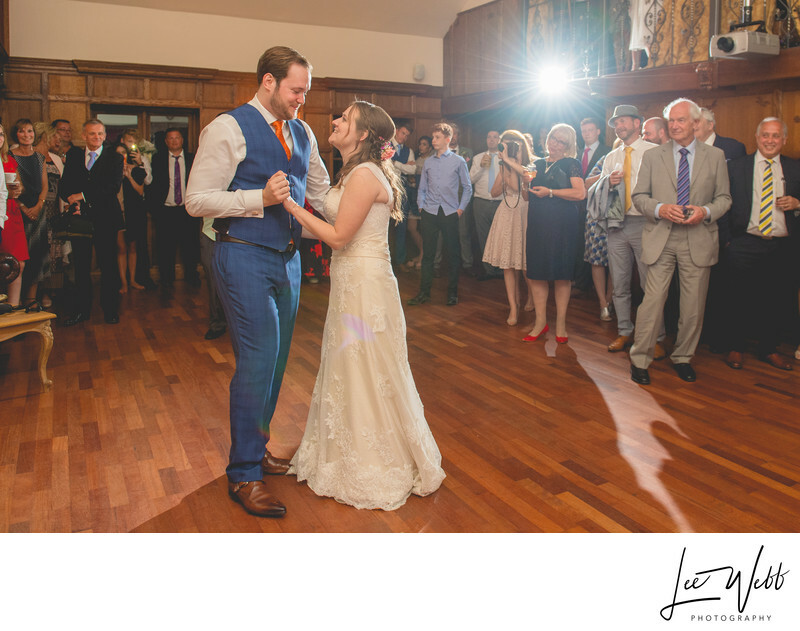 As you look at the building, the newest building on the left is where the wedding breakfasts are hosted, with the older building on the right being the kitchens on the lower levels and a mezzanine on the first floor that overlooks the wood panelled ceremony room deeper in the venue. 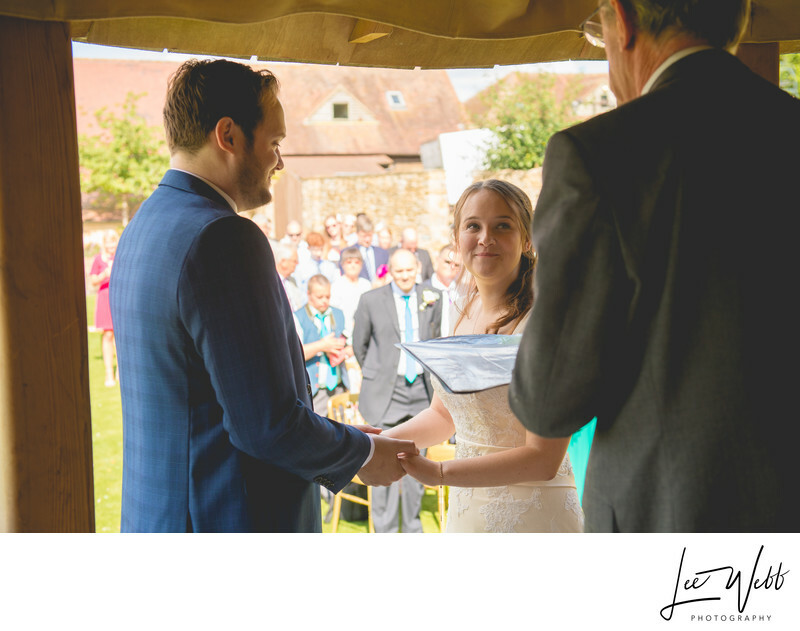 At around 1pm, I made my way towards the rear courtyard where I was expecting the bride to arrive. 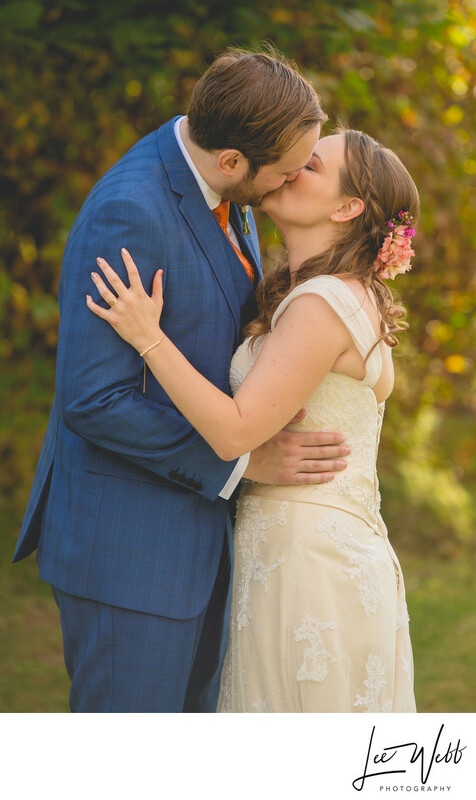 To my surprise, the bride was already inside, having snuck in through the backdoor. She hadn't wanted to alert anyone to her appearance and hadn't even told the venue staff she'd arrived. I guess she wanted some time alone to relax before the more formal parts of the day began. 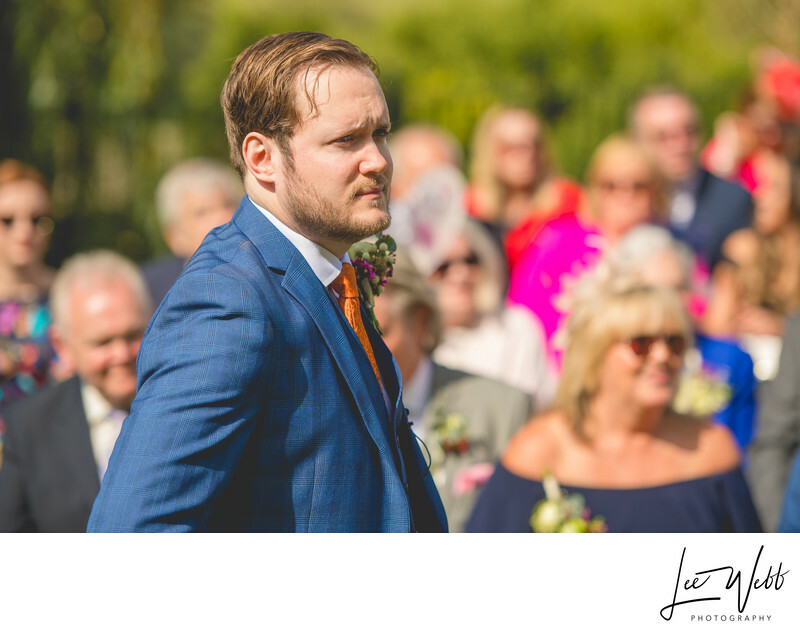 Outside, in the glorious summer sun, the guests had taken their seats and Malc was pacing along the front row of his wedding guests. 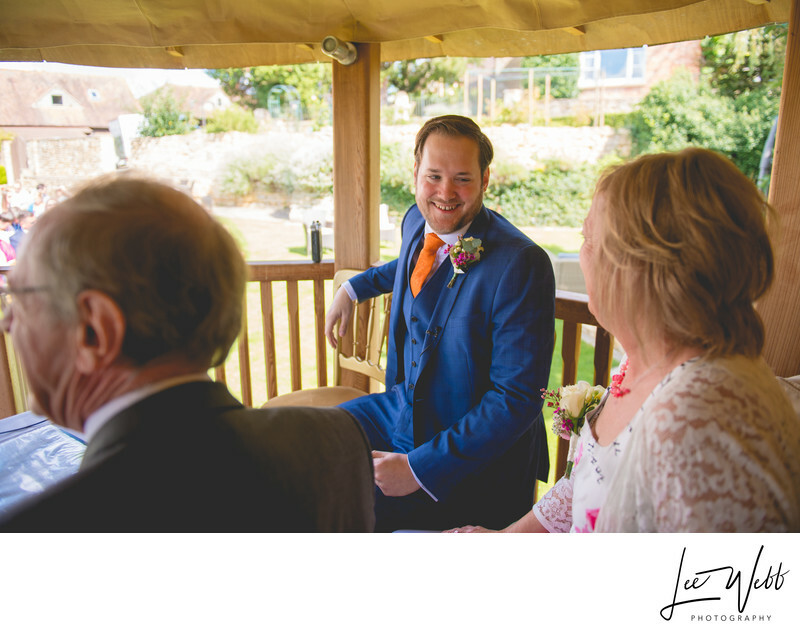 He looked slightly anxious, but as soon as he was in position inside the pagoda he was all smile and couldn't wait to get started! 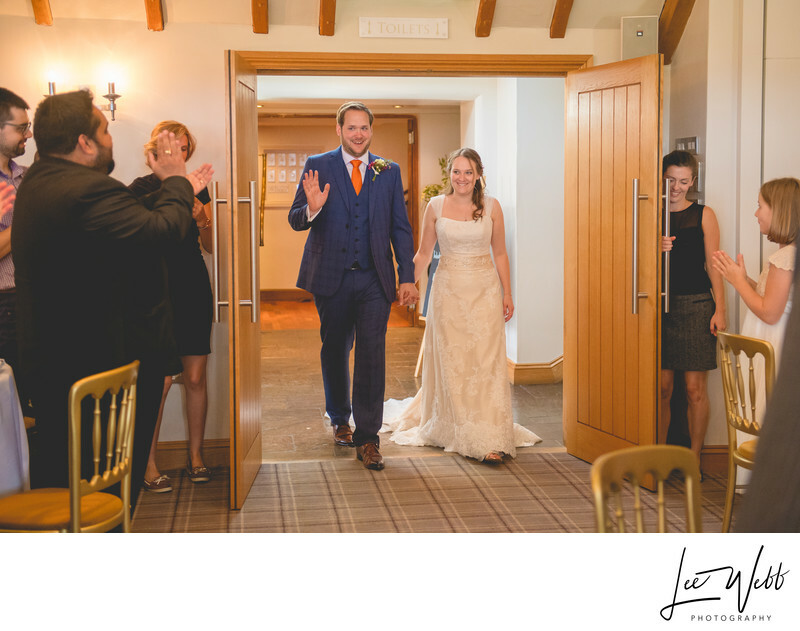 The double doors from the inside of Deer Park Hall to the outside flew open, and out walked the procession of flower girls and bridesmaids. 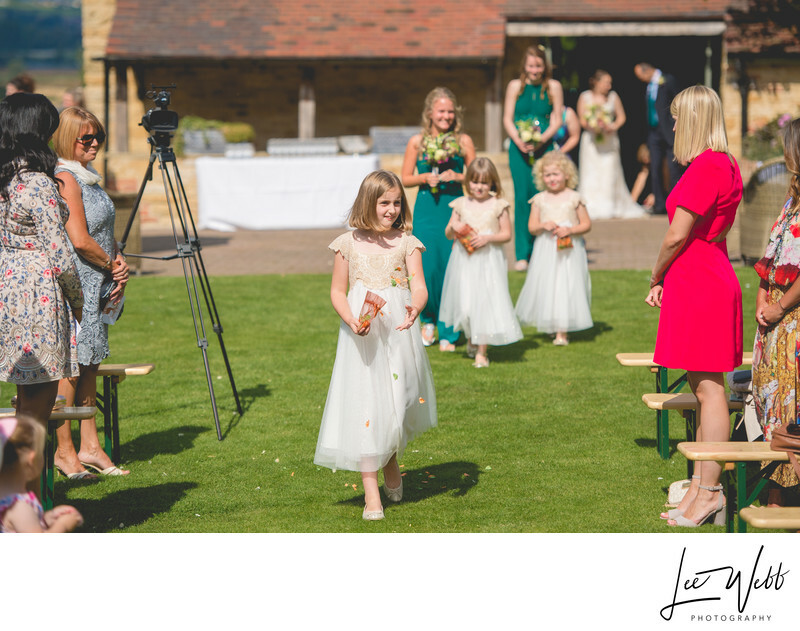 The flower girls were dropping flower petals as they walked before the bride, and these shared the same colour scheme as the bridal bouquet as well as the other flowers that had beeb used to decorate the venue. 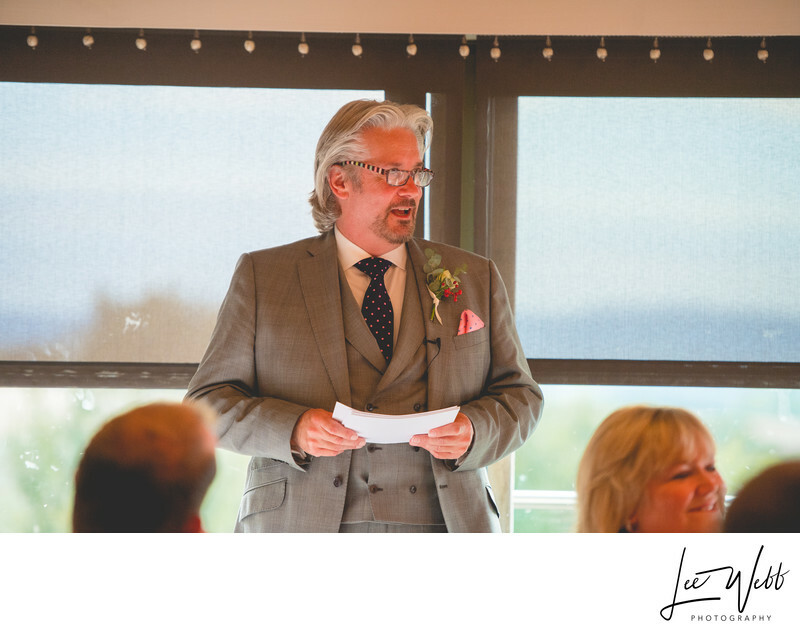 In the background, I could see that bride and her father starting to make their way outside. As the flower girls were all wearing white, I was able to check my exposure settings before the bride properly came into view. 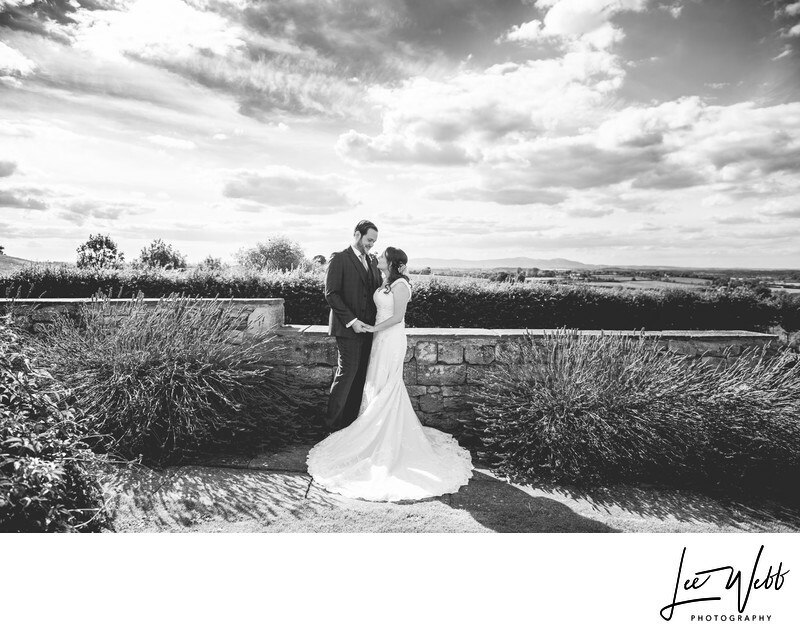 White dresses reflect a lot more light than their surroundings, and if you're not careful you're either left with a wedding dress that's far too bright, or a photo that's generally far too dark. 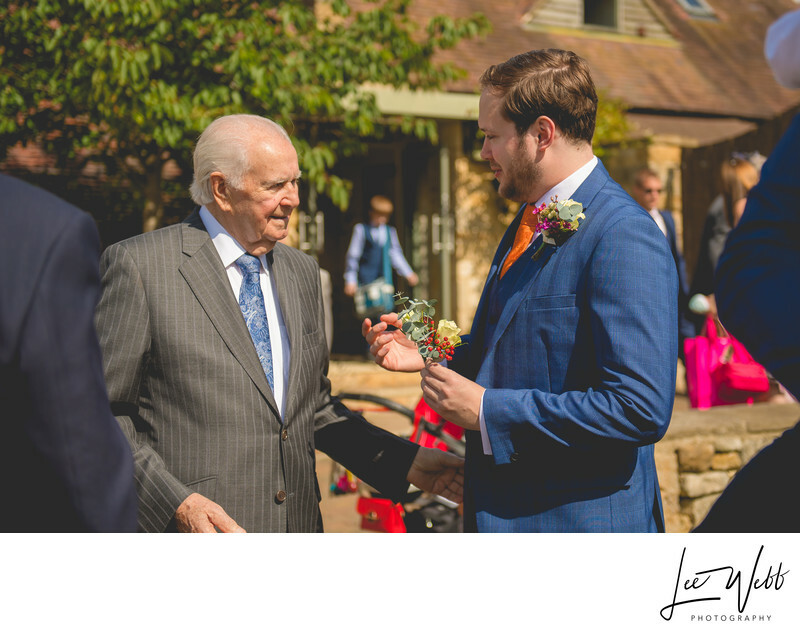 As soon as the bride was properly visible at the back of the bridal party, I shifted my focus onto her and her father who was giving the bride away. 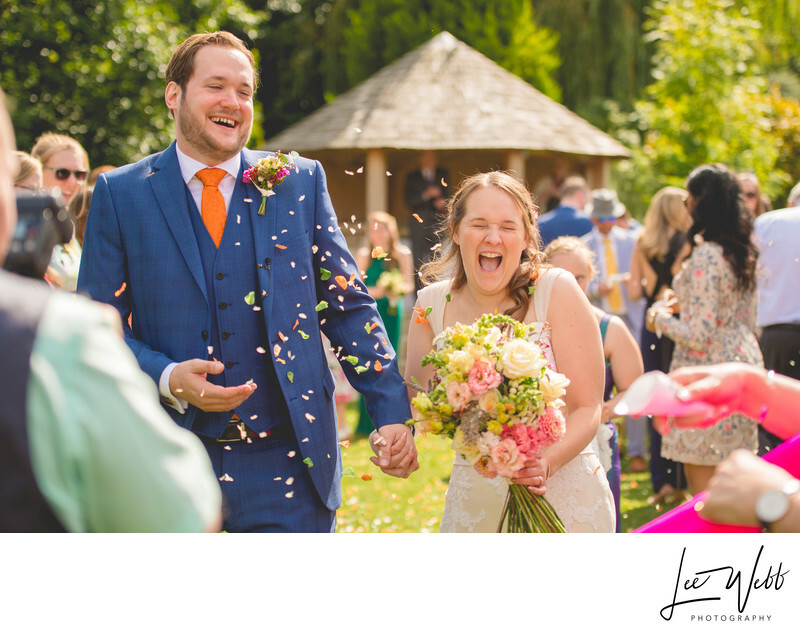 I absolutely love this reaction of the bride (below) - I don't know who or what's she's seen amongst her wedding guests but that smile is amazing! 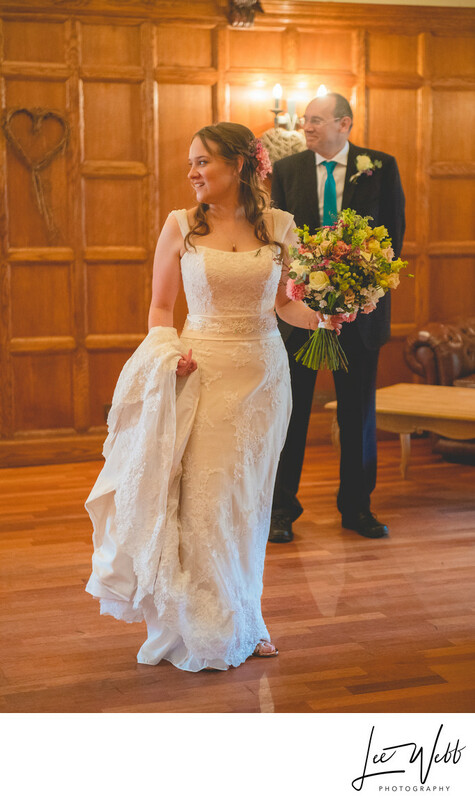 This is one of my favourite photos of the bride making her way up the aisle - surrounded by her friends, family and loved ones, and looking towards the man she's about to marry. 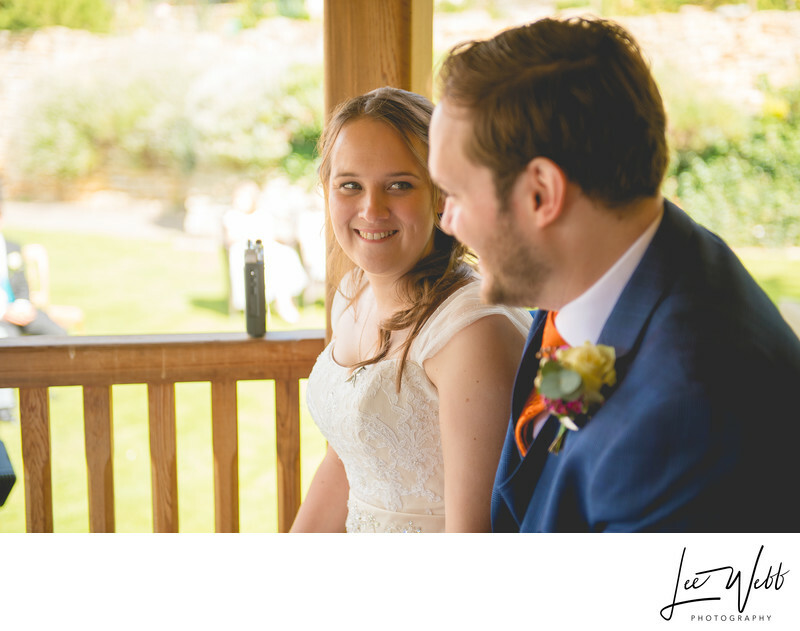 Once inside the garden pagoda, Jacky was asked to sit next to Malc. I love the look she's giving him here, it truly is one of adoration. 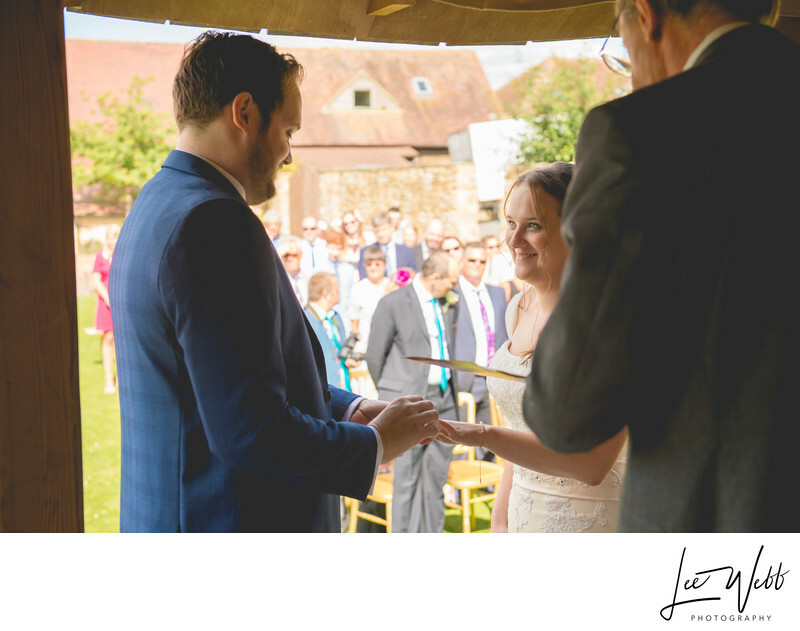 The following two images shows the exchanging of the wedding rings. You can see just how tight it was in there with David, the registrar visible on the right of the frame. 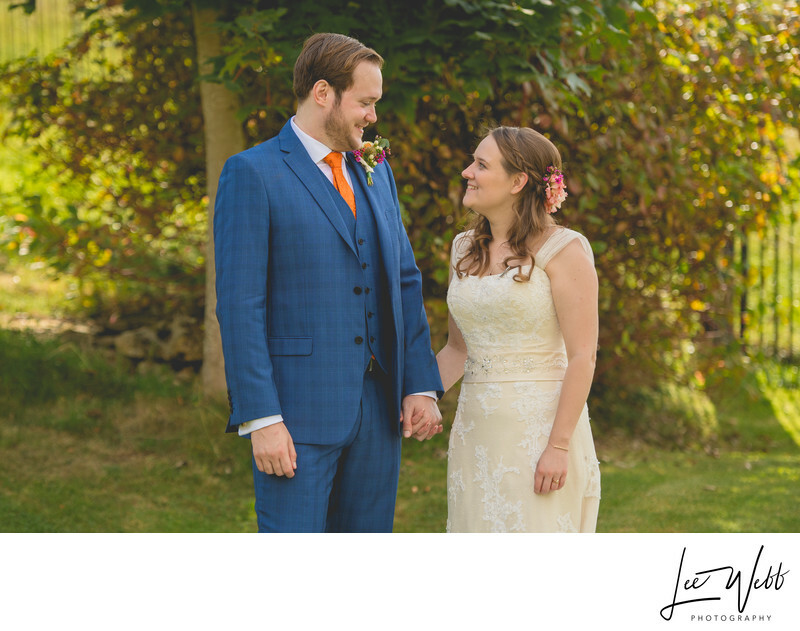 The beautiful sunshine outside provide plenty of light despite the couple being stood in the shade. 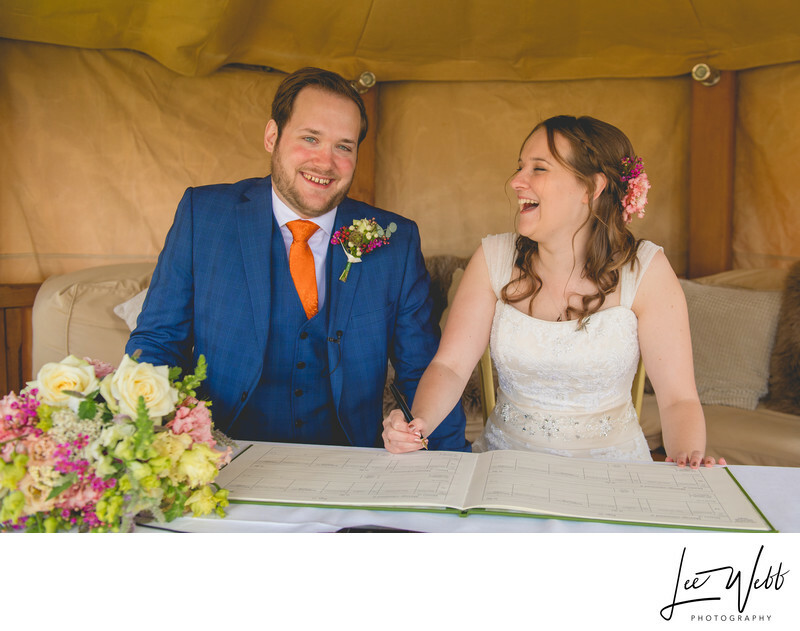 For the signing of the register, I sat the bride and groom down and took a few casual photos of the newlyweds interaction with each other. 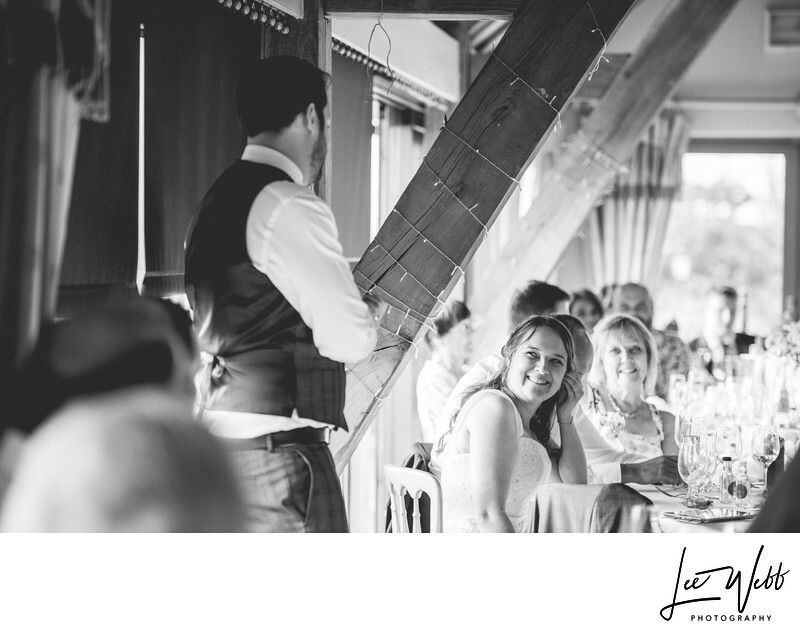 The shade from the roof combined with the bright summer sun outside provides this wonderful warm glow. 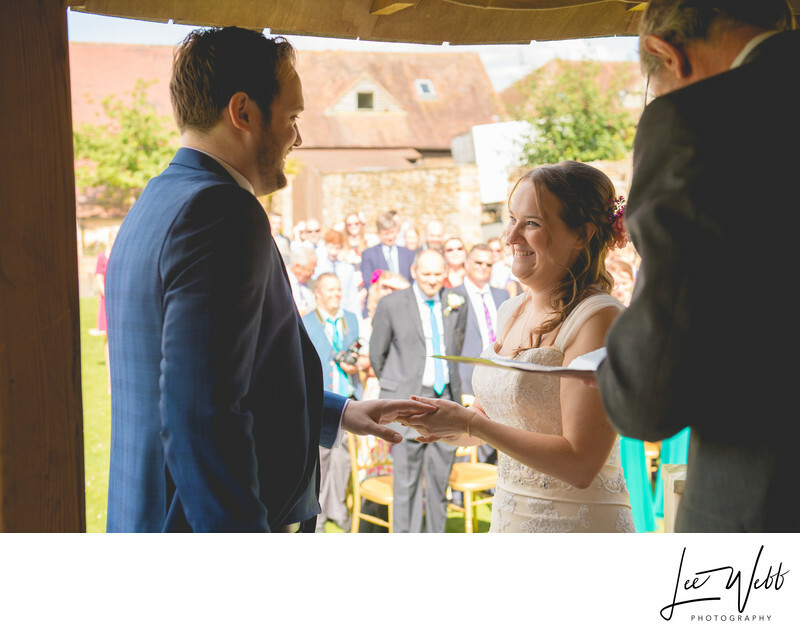 Then it came time for the bride and groom to walk back down the aisle, now husband and wife. The bridesmaids had handed out pre-packed cones of green and orange confetti, and the registrar had asked that all of the guests make their way to the ends of their seating rows as best they could. 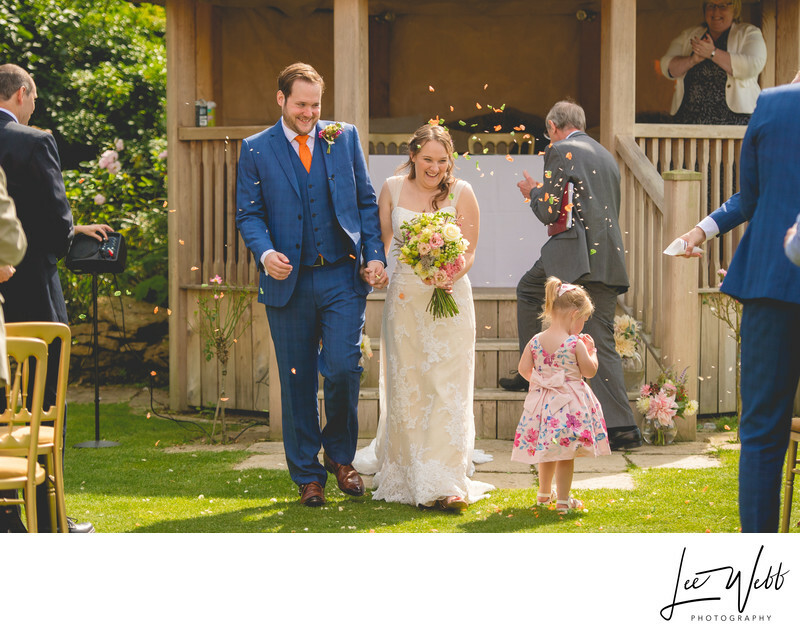 I really like these confetti photos and I think the set up has worked really well too. 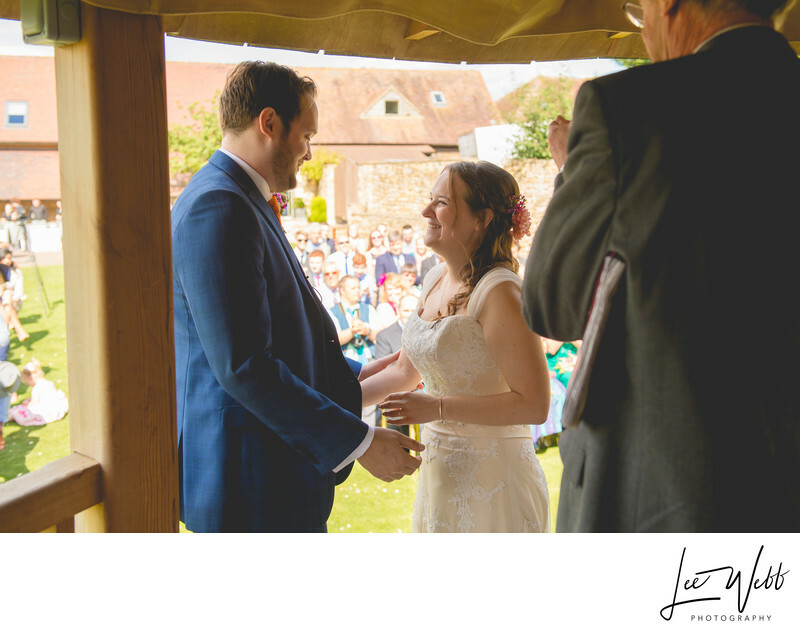 I chose to shoot fairly close-in so I could focus in on the bride and groom's reactions which were of course fantastic. 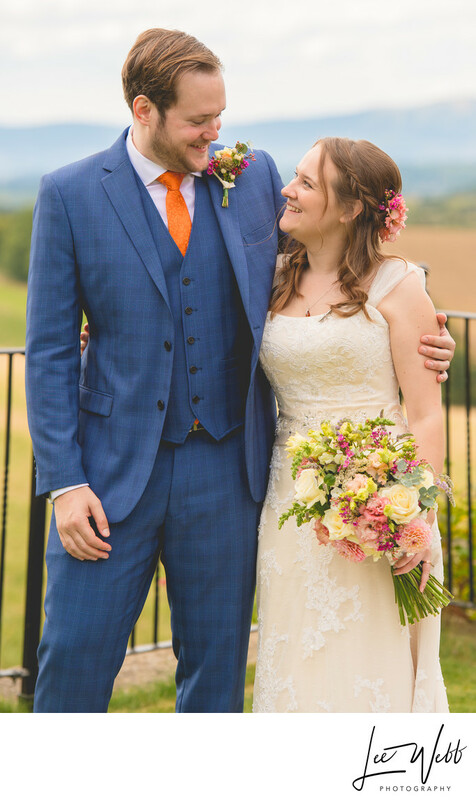 Look how happy they both look! 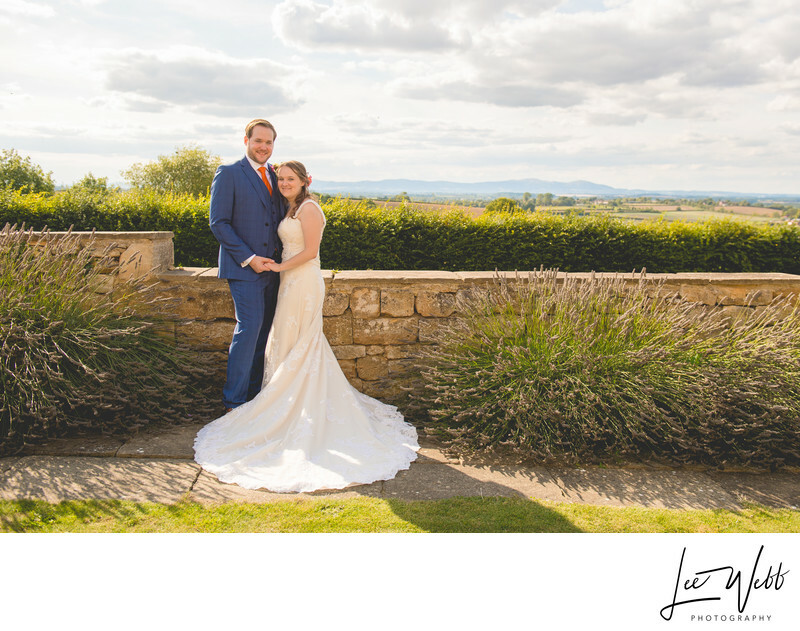 When it came time for the more formal photos to be taken, I used a familiar spot that afford the best views, overlooking Worcestershire with the beautiful Malvern Hills all the way in the distance, some 14 miles away. 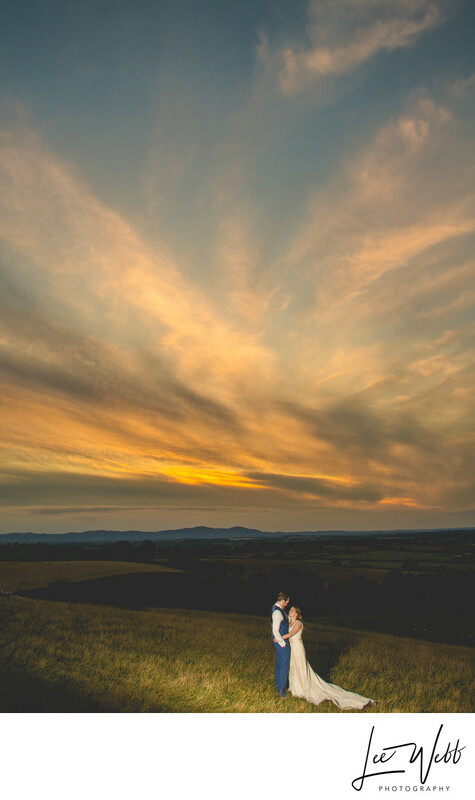 The positioning here is perfect, as the sun would be behind the couple if it hadn't started to cloud over. 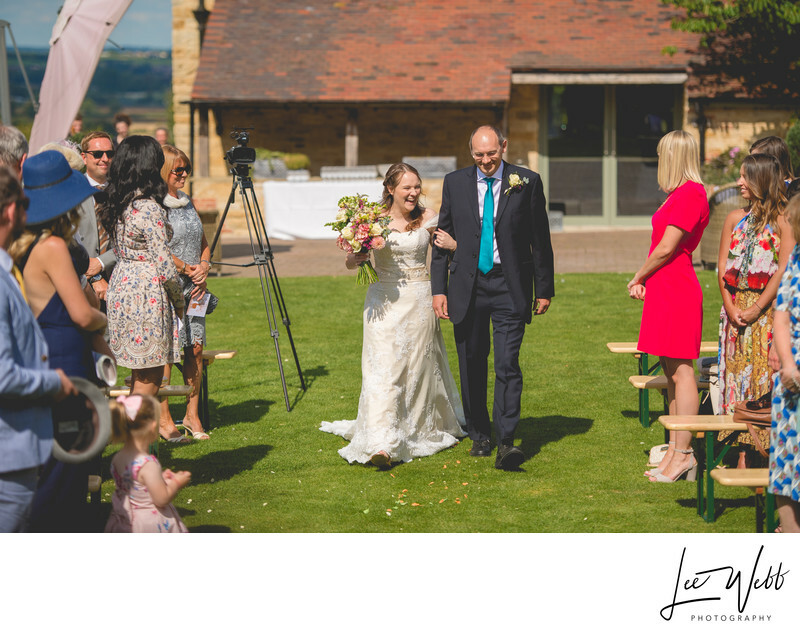 I hear a lot of people hoping for a bright, sunny day when it comes to weddings but from a photography point of view that's not the best option - Bright yes, but sunny no. In an ideal world the conditions would be like those you can see in the next image - bright and overcast. 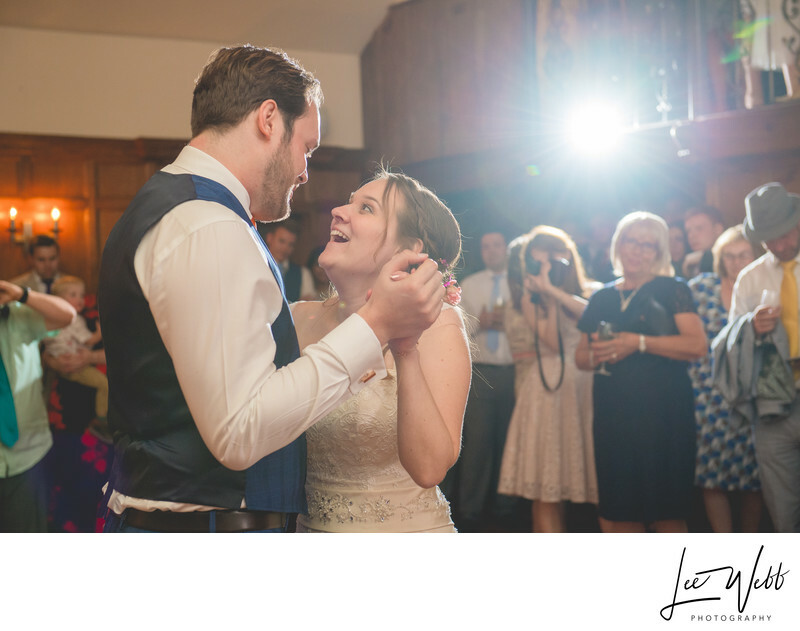 Direct sun gives a lot of contrast, especially at weddings where out of your two subjects, one is usually wearing a light dress and the other usually wearing a dark suit. The enhanced contrast can make things difficult in direct light, which is where overcast conditions become the great leveller - the light is diffused by the clouds, and is much more even. 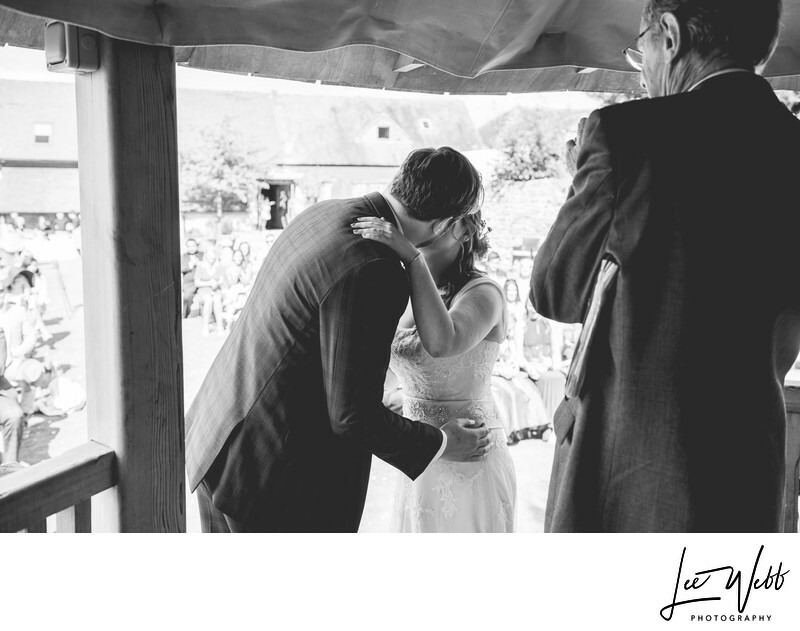 Cameras have a much easier job of dealing with the contrast and the light is very flattering and easy to work with. You might also find that with direct sunlight, the angles at which you can take photos are also limited, as you never want to have the sun across someone's face as it provides long shadows, and having the sun directly in your subject's face is uncomfortable - just imagine staring into the sun for any length of time and you'll know what I mean! 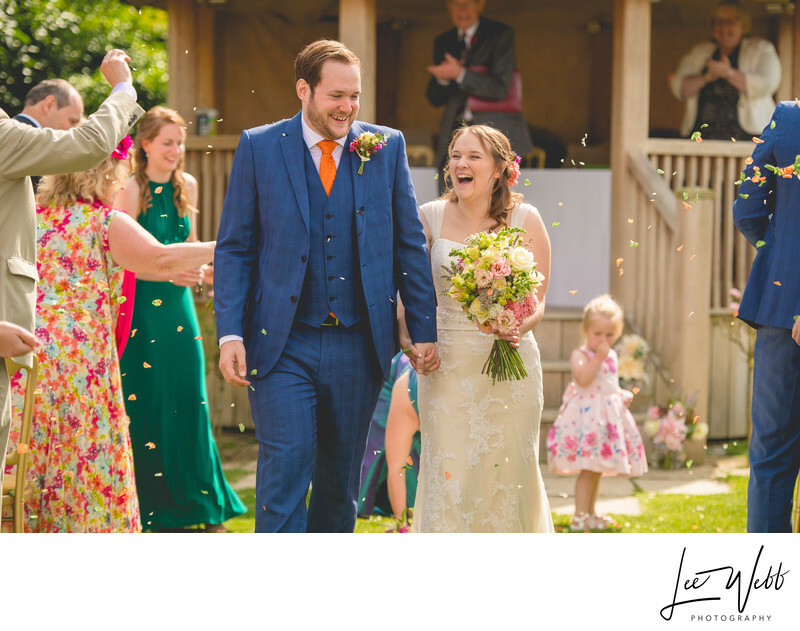 These first two images were snapped candidly; I had positioned the couple exactly where I wanted them, and at the time I was organising the other guests who were necessary for the formal photos. 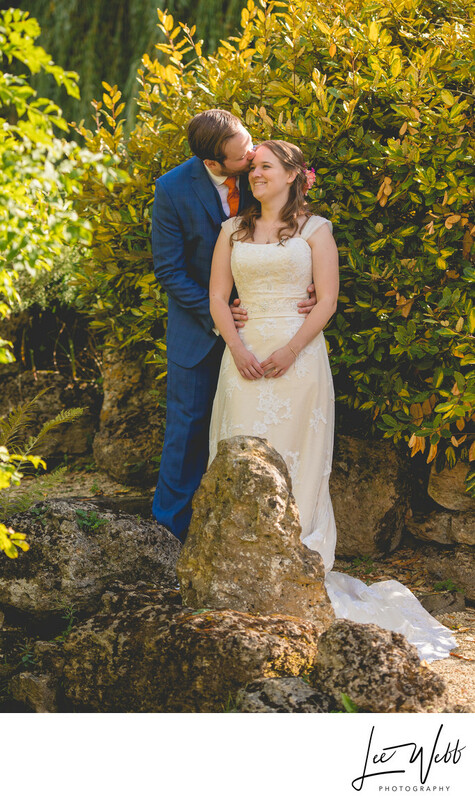 We took around 10 formal group photos, two of which you can see below. I've used these two particular photos to demonstrate the difference between an overcast sky and direct sunlight. In the top image, the light is very smooth and even, but in the second picture you can really see the difference that direct sunlight has made. 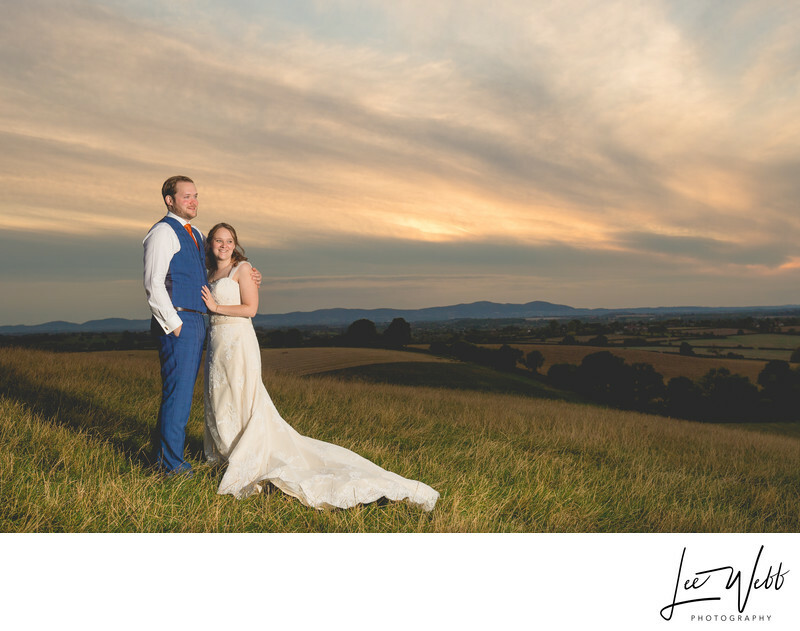 This is one of the reasons that I love Deer Park so much however - With the wedding guests placed so that the sun was behind them in order to take the best possible image, I'm already facing the direction that I would have been, had the sun not had to factor into my planning of the image. 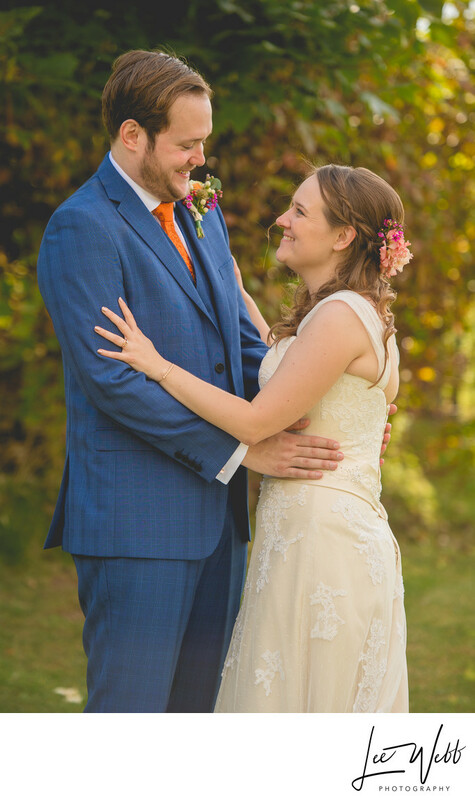 Once I had finished the formal group photos, I moved on to photograph just the bride and groom on their own. 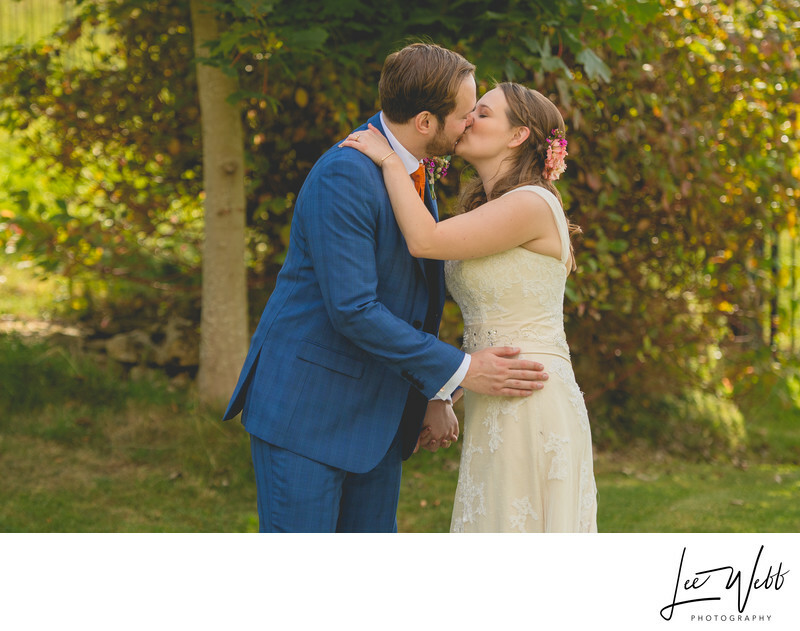 For this, to make my life easier as a photographer, and to give the couple some respite from the scorching summer sun, I placed them in an area of open shade, provided by the large, dense tree that you can see at the back of the following images. 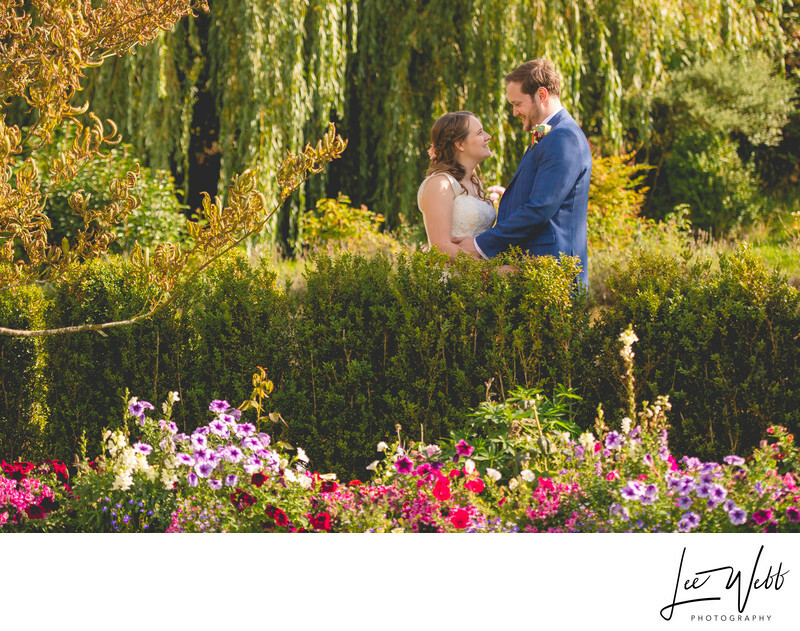 There's a small path consisting of a few stone steps that links the upper and lower gardens which in itself makes for a lovely spot for some couples photos. The direction of the lighting is just right here, and there's enough shade that prevents an overwhelming amount of contrast in the image. The yellow and greens in the background really sets off the blue of Malc's suit well. The flowerbeds were in full bloom and look absolutely amazing! There was a sea of colours with everything from pinks to reds and deep purples. 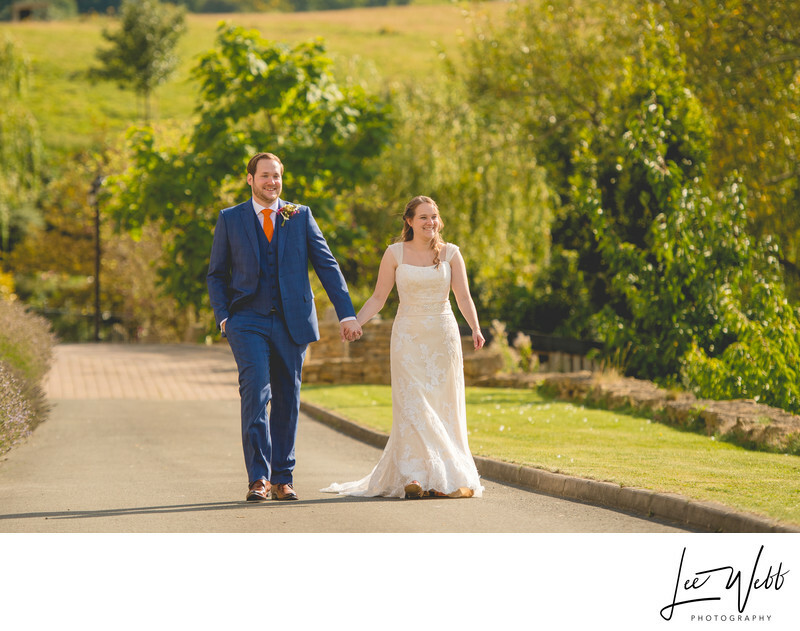 Down the side of Deer Park is a long drive that allows wedding suppliers and guests to drive directly to the back of the venue, but it's also a favourite location for photos of the bride and groom. 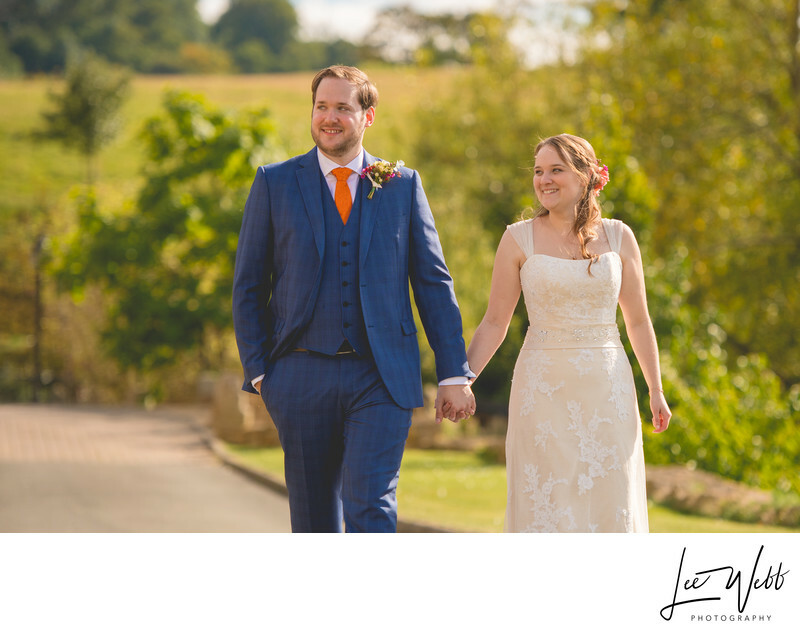 Getting images of the couple walking is a very natural way of taking some great photos that relies on little more than their interaction with each other. 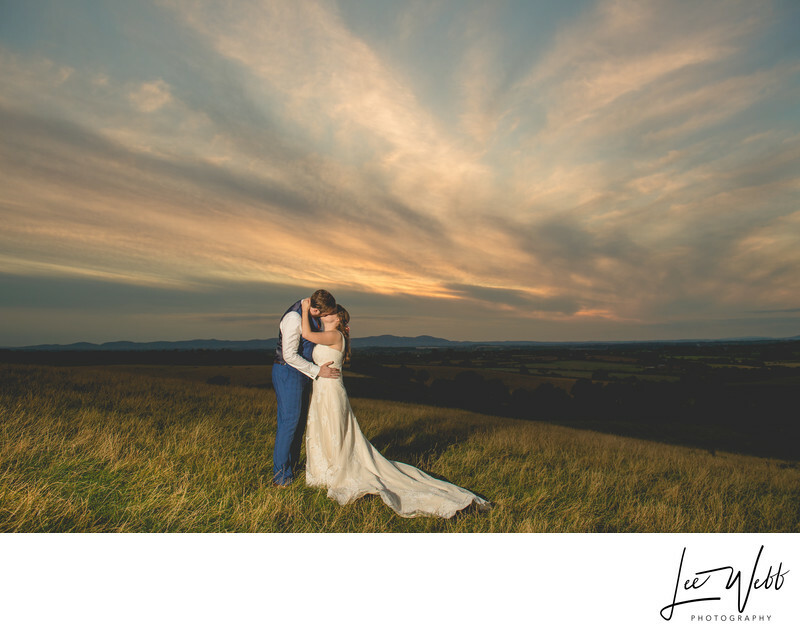 This is one of my favourite locations for wedding photos at Deer Park now, even if I've not been using the location for long . The very front garden at Deer Park is relatively small, but the view it gives is amazing. 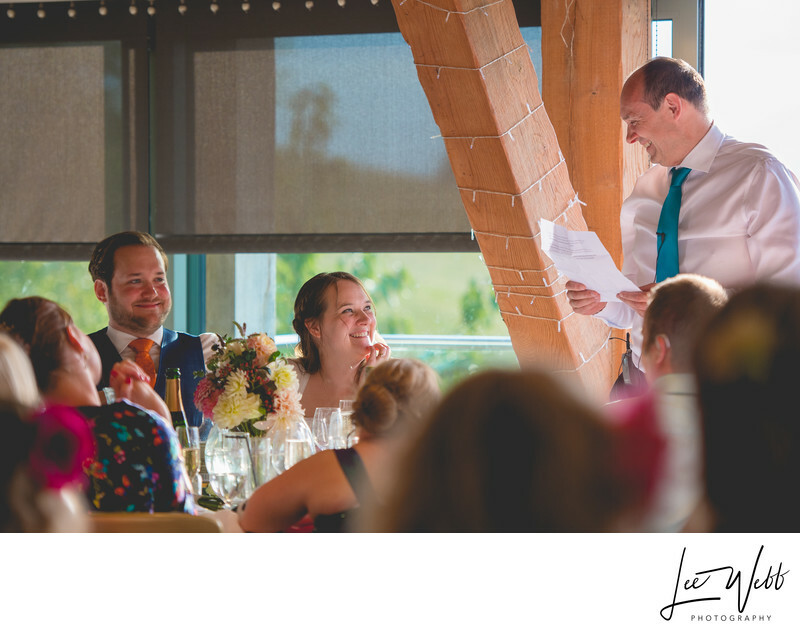 Jackie is a meteorologist and the theme for the wedding was clouds, with clouds featuring on the invites and the table plan. For this reason, I made sure I enhanced the appearance of the clouds in the black and white photo below.